There aren’t many eating houses in Pakistan that have a proper marketing strategy. Most just rely on a few tactics and even those consistently. Consequently, many close shop even before the first year is over. Studio Café has arrived with a decent marketing strategy which is working well for it and may well help it go past the first year. But will it help it become a great brand? To become a great brand, it will have to do a whole lot more than what it is doing right now. Let’s first see what it has been up to. If you want to get a feel of what sort of goodies they are offering, head over to Restaurants Uncut analysis. 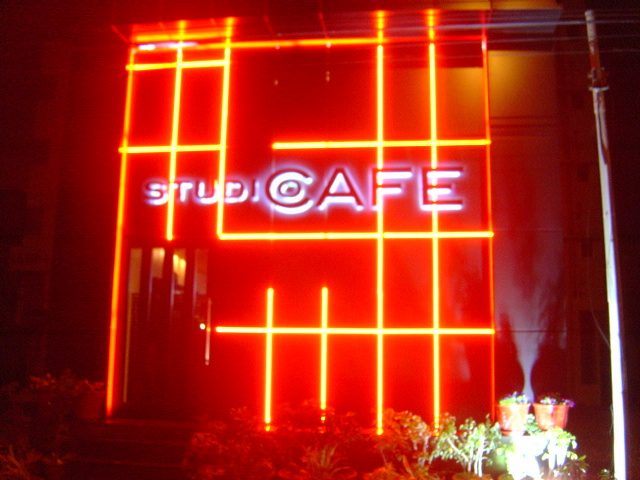 There’s no doubt that Studio Café is far ahead of any café or restaurant in Pakistan in terms of its marketing endeavors. Except maybe OPTP (One Potato Two Potato) which has actually come up with an app for Facebook which enables it to conduct contests and offer prizes in terms of OPTP goodies. Studio Café has a presence on Facebook, and a favorable one but it hasn’t gone to the extent that OPTP has done. But it sure is able to generate quite a following there with a whopping 1,227 fans and counting. And the reason it has been able to do that is because it keeps itself relevant and updated to the latest happening. Come Valentine’s Day, it tailored itself to that. Then when the U-19 Pakistan cricket team got to the finals of the World Cup, it offered a cup of free coffee per table if Pakistan won the Finals, and it communicated this with the help of a poster on Facebook. Someone asked whether it’s one cup per table or per person. So it would have been better had they offered one cup per person. That would have provided more motivation than just one cup. I mean it’s only coffee and not one of their main entrees. And anyway, Pakistan didn’t win and so the offer didn’t materialize. By and large people on Facebook seems to be quite happy with what they are offering, so Studio Café has a real time feedback system and should be able to tell them if they do something horribly wrong. That does not mean they shouldn’t have a feedback card in place at the café which they don’t. People will usually not remember any small foibles by the management enough to comment on it later on facebook but they may well remember it in their subconscious, enough not to come back. That’s one area where they need improving. Then although they have created a Twitter account and they have not written a single Tweet since the place opened shop on 6th December. Can you believe that? Twitter has become one of the most effective viral tools on the net and Studio Café is just keeping it dormant. They need to focus on it more. But what can they do with it? Same thing they are doing with Facebook. If they have a special offering, they should tweet it. Although they seem to be having seven followers on Twitter, on closer inspection you will notice that at least five of them are just spam accounts. So it needs to ensure that it has proper followers on Twitter. The wisest thing Studio Café has done is promote the brand on karachisnob.com. Karachi Snob is fast becoming the online hub of eating houses both for the restaurateurs and the consumers. Not only that but if you Google any restaurant, chances are its going to be mentioned on the top 10 results courtesy Karachi snob. And Karachisnob does do a great job of promoting a food joint, taking brilliant snapshots of that place to create a virtual tour which it showcases along with the general description as well as the menu of the restaurant. They even have a presence on Youtube, but a five second clip containing a solitary image does not make for a good Youtube video by any stretch of the imagination. And this was uploaded by them as part of the publicity hype before the opening. They need to add more material there. But what? It could make a video clip showcasing the portraits that they have taken, taking permission from the people whose snapshot is taken of course. Nine times out of ten people will be eager to be shown on Youtube looking their best. So that shouldn’t post much of a problem. The biggest shortcoming of Studio Café to date is the absence of a website of their own. Sure they have a tremendous presence on karachisnob but karachisnob only offers this focus for a limited time and it costs money each time you want to be highlighted. Once that period expires, you are left with nothing, like it happened with The Original Crepe Factory. Sure there is facebook but facebook cannot compete with a proper website in terms of reach. Studio Café needs that badly before the arrangement expires on karachisnob. Then if they can manage it, a blog to go with the website providing the details of the latest happenings as well as any new product they are introducing, what were the challenges they faced in coming up with that product and how great they think it’s going to turn out. They can even propose a free sampling of the new product, say between 7 to 8 pm only on a specific Monday. That will not only catch the fancy of the target market but ensure it doesn’t cost a fortune by severely limiting the free period range. Which brings us to their menu. They have a pretty limited menu compared to the competitors, but it’s a good thing. Branding laws state that you can never be everything to everyone so why waste the energy? Instead of trying to offer everything under the sun, offer just a few items but focus on making them the best stuff the customer is going to taste that part of the town. But this does not mean they should keep the menu static. Far from it. They need to keep coming with new and innovative dishes which they can promote on their blog, website, facebook and most importantly, within their café.. They could either put it on a blackboard or make a small plaque advertising the new hot stuff. It’s nothing new, most of the big brands like Copper Kettle and Arizona Grill indulge in it, and it’s worth emulating. You need to make the customer coming back for more by tempting him with new exciting recipes. Studio Café is taking maximum advantage of the promotion on karachisnob by including the product of their studio section as well along with the food snaps. But the snaps are almost all wedding portraits, which gives the impression that they only offer wedding portraits. What they need to do is show off a couple of casual photographs as well to show that you don’t need to snap a photo only on a wedding occasion, but you can make every occasion a memorable one and savor it by getting your group photographed. And they would do well to showcase their studio packages as well on karachinob just like what they have done with the menu. In fact they need to showcase these to the diners as well who come to the place, especially the first-timers. The management is assuming that whoever walks into the café is already aware of the three different offerings of the place. Never assume, especially in this business. What they can do is create a master menu which offers the three services: dinner, sheesha and photograph, and then have individual menus for them. In fact, give all the three menus to the customers so that while they’re indulging in one service, they can be tempted to try the other two services as well. We for instance didn’t know about the different offerings of the place and just stayed at the diner lounge because that was where we were seated by the waiter in the first place. During the course of our stay, no one from the management approached us whether we would like to get our group photographed. And that is a serious blunder. Don’t pester the customer but at least let him know what other things you’re offering and what are the price points, then leave him to decide on his own. All in all, Studio Café has done a good job of promoting the place especially online. Just Google it and you would find the top 10 results not only mentioning the place but highly in favor of it. But, and there’s always a but, it needs to further jazz up its marketing especially in the first two years of its life. Remember the happening café Caffeine near MacDonald Sea View which used to offer pretty much the same things as Studio Café minus the photography part. Well, it’s no more. Another rumor doing the rounds is that the whole Khayaban-e-Shahbaz strip on which Studio Café is situated is jinxed. Grapevine has it that quite a few restaurants opened on this strip, did roaring business for the first three months, and then all of a sudden ceased to exist. Studio Café will have to guard against this trend, even talk to the previous entrepreneurs who opened shop here to find out what precisely what went wrong with their business. Getting off to a rollicking start is a good measure of whether the place will survive for long. But it’s not an absolute measure as Caffeine cafe found out the hard way. If you want to get a feel of their sumptuous factor, head over to Restaurants Uncut.